LOS ANGELES – CicLAvia will make the San Fernando Valley its home on March 22 when Metro Presents CicLAvia – The Valley takes place from 9:00 a.m. – 4:00 p.m. The first CicLAvia of 2015 represents the inaugural visit of LA’s renowned open streets event to the Valley. Participants will be able to travel between North Hollywood and Studio City on car-free streets, using foot, pedal and non-motorized wheel power. 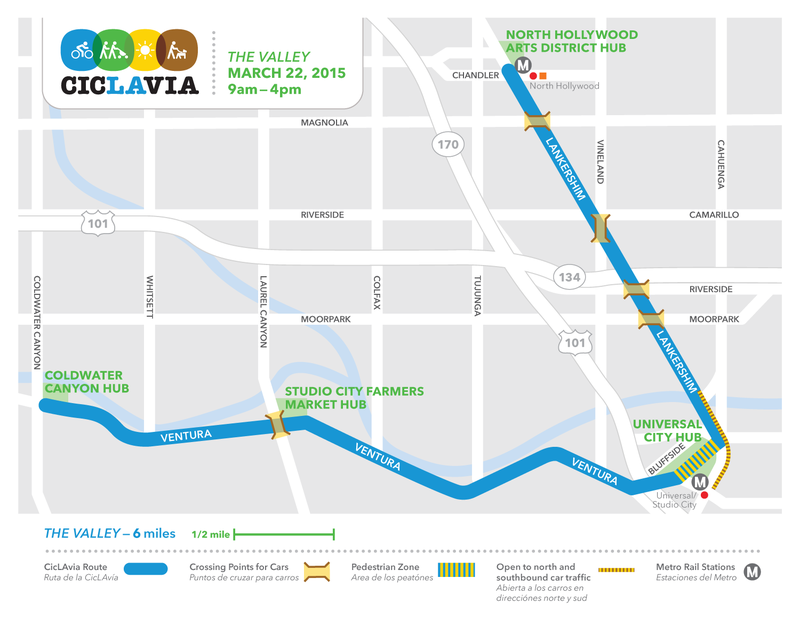 Metro Presents CicLAvia – The Valley runs 5.5 miles along Lankershim Boulevard between the North Hollywood Metro Red Line stop at Chandler Boulevard and the Universal Studio Red Line stop, and along Ventura Boulevard between Campo de Cahuenga and Coldwater Canyon. The route will highlight some of the gems of the East Valley including the North Hollywood Arts District, Universal City, the historic Campo de Cahuenga, Studio City Farmers Market and the famed Sportsmen’s Lodge. City/Venice (August 9) and Heart of LA (October TBD). The funding for the first three routes is provided primarily by the Los Angeles County Metropolitan Transportation Authority (Metro) as part of a $4 million Open Streets grant that was awarded to municipalities throughout Southern California to sponsor car-free events in 2014-2016. The program allocates $2 million annually for these types of events within L.A. County. The program seeks to increase sustainable transportation mode share, including transit, bicycle and pedestrian trips, create opportunities for first time transit usage, and encourage cities to develop multi-modal polices. Other benefits include economic public health benefits and opportunities to highlight and promote cultural resources. CicLAvia has held 11 open streets events since 2010 and is recognized as being a world leader in transforming streets into temporary urban parks. Hundreds of thousands of people have participated in CicLAvia as they connect with their communities, businesses, healthy activity and each other in a way that isn’t possible by car. Partners include Metro, the City of Los Angeles, the Wasserman Foundation and an Anonymous benefactor. Supporters include the Annenberg Foundation, Ralph M. Parsons Foundation, Rosenthal Family Foundation, Los Angeles County Department of Public Health, Durfee Foundation and LA 2050. Sponsors include Los Angeles County Department of Water and Power, David Bohnett Foundation, Roth Family Foundation, Southern California Gas Company, Tern Bicycles, Indie Printing and Los Angeles County Bicycle Coalition. Media Sponsors include The Los Angeles Times and Laemmle Theatres. Metro is a multimodal transportation agency that is actually three companies in one: a major operator that transports about 1.5 million boarding passengers on an average weekday on a fleet of 2,000 clean air buses and six rail lines; a major construction agency that oversees many bus, rail, highway and other mobility related building projects, and Metro is the lead transportation planning and programming agency for Los Angeles County. Stay informed by following Metro on The Source and El Pasajero at metro.net, facebook.com/losangelesmetro, twitter:metrolosangeles, twitter.com/metroLAalerts and instagram.com/metrolosangeles. Metro Board Chair and LA mayor Eric Garcetti. “This is a great opportunity for people to see how Metro can get them where they need to go without driving.” Hmm…this will demonstrate how a bicycle could get you to both subway stations in the San Fernando Valley if there was some bicycle specific infrastructure installed along Lankershim Blvd. LA city council members from district 2 and 4 are against installing bike lanes on Lankershim Blvd from Chandler Blvd to Ventura Blvd. Why not route this at the northwest end of the Vally; where the Orange line ends; in Chatsworth, where there is the light vehicle traffic and NOT at one of the Valley’s busiest intersection and streets.